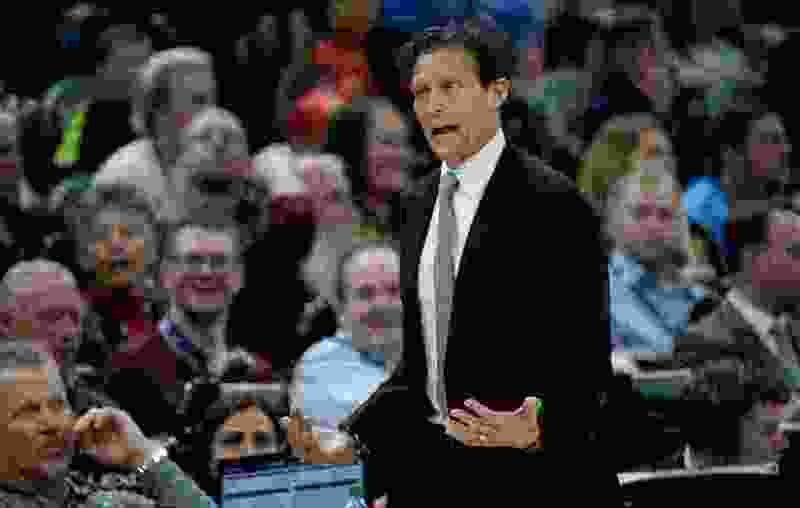 (Francisco Kjolseth | The Salt Lake Tribune) Utah Jazz head coach Quin Snyder areas with a referee as the Utah Jazz host the Denver Nuggets in their NBA game at Vivint Smart Home Arena Tuesday, April 9, 2019, in Salt Lake City. Suffice it to say that the Jazz will be happy to finally have learned their playoff opponent. That’s one reason why the Jazz haven’t resorted to some of losing measures of other teams around them. For example, the Nuggets chose to rest their best players on Sunday against the Blazers, even though doing so risked the No. 2 seed. The rationale? Getting the Rockets out of their playoff bracket, setting themselves up for a potential run to the Western Conference Finals. The Jazz could have lost intentionally on Tuesday against Denver, but chose not to given those external factors out of their control. Then there’s this, from Snyder’s perspective: every team in the West, especially in the playoffs, is going to be a tough out. “I remember someone saying that we’re two games out of last, and however many games out of the playoffs,” Snyder said. It wasn’t quite that drastic: The Phoenix Suns were always pretty solidly at the bottom of the conference. But as late as Dec. 18, the Jazz were the 14th seed in the 15-team Western Conference with a 14-17 record, before digging themselves out of their early schedule to finish with a 50-win season. “There’s just a lot of good teams. It’s fitting that so many matchups and seedings are going down to the last day,” Snyder said. Ralph Lawler has called 3,229 games for the Los Angeles Clippers over the past 40 years, but on Wednesday night against the Jazz, he called his last regular-season contest. While he was known for those phrases, scattered around 40 years of the highlights of the Clippers and their opponents, Lawler also introduced “Lawler’s Law," which states that the first team to 100 points will win the game. Since 1996-97, Lawler’s Law has been correct 93.10% of the time, though this season it has dropped to 87.9% in a high-scoring year.